A fresh retelling of the Russian fairy tale Ivan and the Grey Wolf. If you love mythology, fairy tales, or epic fantasy, you are in for a treat. Armed with the power of the song, Voran must hunt down the dark spirit before it achieves its goal of immortality. His quest takes him through doorways to other worlds and puts him on a collision course with seductive nymphs and riddling giants. With each step of the journey, the strength of the villainous spirit grows, as does Voran’s fear that the only way to save his world… is to let it be destroyed. The Song of the Sirin is an epic fantasy retelling of the Russian fairy tale Prince Ivan and the Grey Wolf. If you like the hero’s journey, creative twists on mythology, and classic fantasy, then you’ll love Nicholas Kotar’s sweeping tale. 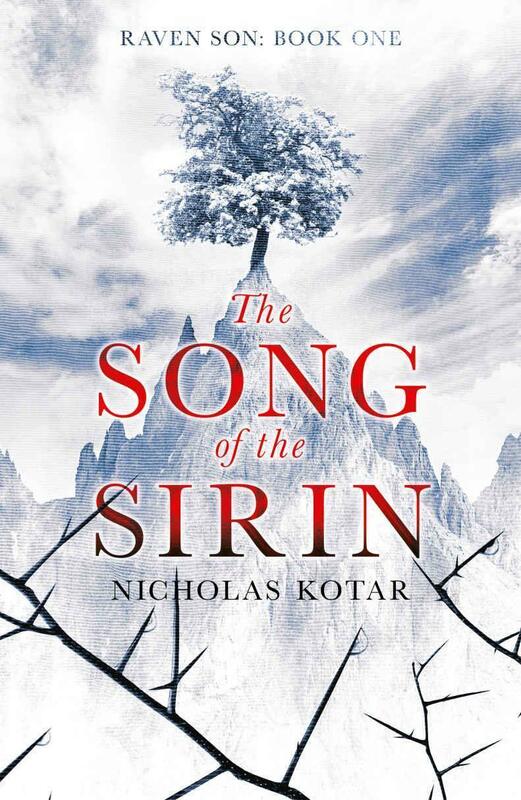 The Song of the Sirin reads like a fairy tale, and rightly so: it is an epic fantasy retelling of the Russian fairy tale Ivan and the Grey Wolf. In this first installment of Nicholas Kotar’s rendition of the tale, we readers see the ancient roots of the people of Vasyllia—and a bit of ourselves. In Ancient Vasyllia, the flame of the protective Covenant Tree burned brightly in the hearts of its people; now, even the righteous have forgotten the history behind their prosperity. Young Voran, the son of a now-disgraced warrior, never would have believed the ancient tales or the creatures in them are real—except that in the first chapter of the book, he encounters three legendary beings, shaking him to his core. Soon he is on a quest that takes him to other worlds. He faces riddling giants and shape-shifting hags while preparing to confront the ancient evil being threatening to destroy all that is good in the world. The Vasyllis’ collective forgetfulness has shaped them into an isolationist, divided, materialistic society, and they have little idea of the dark forces waiting for the protection to lift. The fate of Vasyllia is at the crux of the conflict between good and evil in this world. Kotar’s book has many compelling elements: fantastic beasts, seduction, descriptions of landscapes that ignite the imagination, disgrace with the opportunity for redemption, betrayal, and battle scenes. I also appreciated the running themes of the importance of honoring your history and looking beyond your own walls. Within the city of Vasyllia, the disparity between the three castes, or “reaches,” is vast, and the wealthy third reachers treat the squalid first reachers with apathy at best. As signs of darkness occur with increasing frequency and severity, the wealthy and “pious” shut out their own poor and refugees from neighboring communities. Only those Vasylli noble of heart and fortunate enough to be visited by the Sirin know that those very acts of heartless selfishness put their future in greater jeopardy. There are several heroes in this story, and they are human. They face their greatest vulnerabilities, and sometimes they succumb to their baser desires. Even when we think the love between two heroes is written in the stars, even when we think someone is destined to save Vasyllia, we are reminded that these would-be heroes are deeply flawed and have a lot to learn. Forces for evil try to feed the heroes’ weaknesses so they are all-consuming. With the flames of Sirin songs warming their hearts, a select few Vasylli are the only remaining hope for their world, choosing what is right over what is easy; leading and acting with love; and becoming the stuff of legends for generations to come. Although the writing started a little awkwardly and I found some of Kotar’s plot and word choices to be a bit cheesy, overall I found myself speeding through the pages, captivated by the story. If you love mythology, fairy tales, or epic fantasy, you are in for a treat. The song teased Voran at the first hint of sunrise. His sister Lebía still slept, and he rose quietly, trying not to wake her. Outside his window, the trees were encased in overnight ice. Branches, like freshly-minted blades, clanged against each other in an almost military salute. As Voran leaned against the sill, the sun breached the summit-lines, and the ice-encased branches glowed from within. The song rose in a vast crescendo, then faded again. It stopped his breath short like a punch to the chest. “Ammil,” said Lebía from across the room, her hair rumpled from sleep. “Ammil, little bird?” he whispered, hoping she would turn over and fall asleep again. It cut him deeply that she still could not sleep on her own, despite her sixteen years. Voran smiled, though there was little to smile about in the purple shadows under her eyes. She needed to sleep if she were ever to find her joy again. “What is that?” She indicated the parchment lying on the sill, garish in its profusion of purple and red. “One of the Dar’s huntsmen claims to have seen the white stag.” Personally, Voran doubted it. Privately, Voran wondered at the Dar’s eagerness. Yes, catching the white stag was supposed to bring prosperity to the hunter’s city for seven generations. But although legends grew in Vasyllia with the same profusion as lilac trees, they mostly stayed bound to the page. “Why does he want the approval of his advisors? Couldn’t he just announce the hunt, and be done with it?” she asked, rubbing her right eye with the heel of her palm. Voran laughed. “I agree with that sentiment wholeheartedly.” He would much rather wander the wilds than sit in council with the representatives of the three reaches of Vasyllia. She looked away as soon as she said it. His conscience pricked him. Lebía was practically begging him, and he knew how much she hated to beg. It had been far too long since he stayed with Lebía at home, helped in the kitchens, took a long walk through the family vineyards, or actually read something with her. But Dar Antomír depended on him. Even more than he depended on his son, Mirnían. Yes, I can, he thought. Why do you think I avoid it so much? Nothing like an empty house to remind you of your parents’ absence. She looked at him without blinking for what seemed an inhumanly long time. Her look only mirrored his own thoughts. He didn’t love us enough to stay. She hugged him and turned over. Within a minute, her breathing had deepened into sleep. May all the Powers damn him for leaving you, Lebía. The curse did not give him the pleasure he hoped. It gave him no sudden illumination about the nature of Aglaia’s disease. It suggested nothing new about Otchigen’s madness and subsequent disappearance after implication in the mass murder of other Vasylli. Nothing but questions, as always. At this early hour, he went out the back door of the wine cellar, chary of waking the servants. He managed to close the door with no noise, but the gate at the end of the overgrown back garden moaned like a thing diseased. It always did, but Voran always forgot. Cursing inwardly, Voran looked back at the house. No one seemed to stir within. The house’s two stories lurched over him, the shadows thrown back by the morning sun, threatening him. As though the house itself were angry that Voran was master instead of his lost father Otchigen. As though it were Voran’s fault that his mother had fallen prey to a strange illness, then disappeared inexplicably. The song appeared again, hardly more substantial than the red alpenglow on the underside of the clouds. Voran’s heart swelled as he turned away. Otchigen’s house was nestled among the other estates of the third reach of Vasyllia. Voran loved to walk the flagstoned road through the reach as it crisscrossed the cherry groves of the noble families. Amid the trees, the mansions—each a fancy in carved gables, lintels, and columns—stared at each other as though they, like their masters, were jealous of each other’s status. Some of the most extravagant even sported gilded cockerels on the roof. Voran was grateful that it was generally considered in bad taste. Every house was built on a small mound, to better overlook the other two reaches that extended downward and outward along the slope of the mountain, like the skirts of a great dress. Voran knew that, if looked at from below, the houses sparkled like jewels every morning: a reminder to the lower reaches that such opulence was as far out of their reach as the Heights themselves. Voran stopped at a crossroads where stairs carved into the mountain led down to the second reach. Just to his left was the Dar’s palace, its seven onion-domed towers carved out of marble blocks, each larger than a single man. He hesitated, unwilling to brave the nagging of the small council yet. The second reach spread out beneath him in clean lines of austere homes set apart by stone hedges, staircases, and canals, all in keeping with the military calling of most of the inhabitants. “Make way,” said a voice behind him. Before Voran could turn around, a mail-shod shoulder pushed him off the path. Voran landed knee-first in mud. The two sub-wardens flanking him laughed, but their knuckles were white on their pommels. “Ever the paragon of civility, Vohin Rogdai,” said Voran, forcing his tone to remain calm. He would have preferred to knock the idiot’s teeth into the back of his head. “Thank you for pointing out the weakness in my defense. I will gladly accept your further instruction in the sword-ring.” Where I’ll poke more holes into you than a sieve. Where fewer people can see how bad you are, Voran thought, or how you cheat. “No, in my father’s honor.” Voran smiled at the way Rogdai twitched. Voran was sure he would just walk away. The coward. Rogdai and his flunkeys walked by, their shoulders not quite as straight as before. The wind picked up and whipped Voran’s hair into his face. Annoyed, he pulled it back. As he did, the song rose as though it were carried by the wind. He gasped for a moment, it was so intense. And it seemed to whisper a thought to him. Go now. Forget the small council. Go find the stag now. Leave the blind to lead the blind. Voran was running even before he realized it, but not toward the palace. He angled away away from it, toward the headwall of Vasyllia Mountain. Voran avoided the streets, sprinting along dirt paths behind the gardens of the third reach. Here, the trees were wilder—native fir and spruce for the most part. Sometimes avoiding the paths outright, Voran veered toward the largest of many canals that watered the three reaches, all of them fed by Vasyllia’s twin waterfalls. As he reached the canal, all signs of domestication faded, replaced by mossy rocks and tree roots. Even the air smelled differently here. The spicy smells of the nobles’ kitchens gave way to the cool scent of pine. Though he knew the way well enough, it took him a moment to find the ivy-encrusted archway that led to a staircase going up, away from the city. Dar Antomír would forgive him, Voran was sure. Especially if he found the stag. An honor for his family, a boon to his disgraced name. Seven generations of prosperity to his city. If the legends were to be believed, of course. Did he believe them? Voran wasn’t sure any more. The wind gusted, dousing him with the spume of Vasyllia’s twin waterfalls, thundering on either side of the ancient stairway. With it came the music, louder than ever. He closed his eyes, savoring. Only when he clung to the face of the mountain was the melody this vivid. It sounded as if the mountain, the trees, the clouds all sang. And only for him. He reached a ledge and pulled himself up. He was soaked from the exertion and the mist. Falling on one knee, he raised both arms toward the rising sun. The song hung on the air like a memory, then faded. He leaned back against one of the stone chalices that collected the water from the falls, each taller than Vasyllia’s famed birches. The chalice hummed with the steady rhythm of the waterfall pounding it. At Voran’s feet, a stone mouth faintly reminiscent of a dragon’s head spit the gathered water toward the city’s canals. How mad and beautiful, he thought, considering the dragon. In the old times things were made with beauty in mind, not merely usefulness. How unlike these times. With the passing of the song, Voran felt emptied, hungry for a recurrence of the song. It did not return. Voran stretched his shoulders, relief flooding into the popping joints. He sat at the ledge's lip, resting his feet on the dragon’s ears. Miles upon miles of the woods beyond the city lay carpeted at his feet. It was the perfect vantage point. As he stared into the spaces between the trees, Lebía’s shadowed eyes kept intruding on his thoughts. He really should spend more time with her, not conjure up excuses to remain at the warrior seminary after hours, training the boys. Her plea pained him. He had not realized that she was so lonely at home. But of course she was. She had few friends, tainted as she was with their father’s assumed guilt, their mother’s inexplicable disappearance. He promised himself he would take her to the forests more often. Maybe even let her spend the night under the stars with him, as he so loved to do. He was so wrapped up with the image of her smiling at the innumerable falling stars on a late summer night that he nearly missed it. Something gold flashed in the woods far beneath him. Voran’s heart stopped, then raced forward. A white streak passed through the trees. Fearful of moving even a muscle lest the vision fade, Voran continued to stare. It moved again, now clearly visible. A white stag. It took Voran a maddening hour to get through the city’s reaches and out the gates. Another half hour away from the paths as he tried to get his bearings in the forests beyond the city. He was intent on his path like a pointer on the scent. But when the howling started, his blood turned to ice in his veins. He had heard wolves before. This was no mere wolf. The sound was deeper and darker, like the buzz of a hornet compared to a fly. He tried to recall the details of the many stories of the white stag. Was there a legendary predator to accompany the legendary quarry? Not that he could remember. A blur of white raced before his eyes, so close he could spit at it. In an instant, it was gone. The sun showered the foliage with dappled light. Something that was not the sun—a strange golden mist-light—flickered through the trunks, as though the stag had left a trail of light behind it. The mist beckoned him deeper into the forest. Voran plunged headlong into the deepwood. The strange light continued before him for a mile or so, then blinked out. Voran looked around and realized he had never been in this place before. He stood on the edge of a clearing awash in morning sun, so bright compared to the gloom of the woods that he could see nothing in it but white light. He stepped forward. The light overwhelmed him, forcing him to crouch over and shield his eyes. Fuzzy at first, then resolving as Voran’s eyes grew accustomed to the light, the white stag towered in the middle of the clearing, almost man-high at the shoulder. Its antlers gleamed gold, so bright that they competed with the sun. Voran froze in place and adopted the deep, silent breathing pattern that an old woodsman taught him in childhood. Inch by inch, he reached for his bow. His quiver hung at his side in the Karilan manner, so taking the arrow would be the work of half a second, but extricating the bow strapped to his back was another matter. A single bead of sweat dropped from his forehead and slid down the side of his nose, tickling him. The deer turned its head to Voran, showing no inclination to flee. As though Voran were nothing more than a fly, it flicked both ears and continued to graze. The howl repeated, just to Voran’s right. Out of the trees crept a black wolf the size of a bear, its fur glistening in the light of the antlers. It paid no heed to Voran, leading with bristling head toward the grazing deer. It lunged, blurring in Voran’s vision like a war-spear, but the stag leaped over it and merely moved farther off to continue grazing. The wolf howled again and lunged again. Back and forth they danced, but the stag knew the steps of this death-dance better than the wolf. His nonchalance seemed to infuriate the hunter. The wolf charged so fast that Voran missed its attack. The deer flew higher than Voran thought possible, and its golden antlers slammed the wolf’s flank like a barbed mace. The wolf screamed. The sound ripped through Voran, an almost physical pain. The stag trotted to the other end of the clearing. Looking back once more, it waited. Gooseflesh tickled Voran’s neck. The stag called to him, teasing him to continue the hunt. Voran ran, and the deer launched off its back legs and flew into the waiting embrace of the trees. Voran stopped. His body strained forward, intent on the hunt, but his heart pulled back. The wolf. He could not leave a suffering creature to die, even if it was the size of a bear, even if it would probably try to kill him if he approached. With a groan for his lost quarry, Voran turned back. The wolf dragged itself forward with its forepaws. Each black claw was the size of a dagger. As Voran approached, its ears went flat against its head, and it growled deep in its throat. Voran’s hands shook. Gritting his teeth, he balled his hands into fists and willed himself to look the wolf in the eye. Its ears went up like an inquisitive dog’s. It whined. In the eyes of the wolf, Voran saw recognition. This was a reasoning creature, not a wild animal. The wolf stared at him, then nodded twice. Voran pulled a homemade salve—one of Lebía’s own making—from a pouch on his quiver. Tearing a strip from his linen shirt, he soaked it with the oils and cleaned the wound of tiny fragments of bone. The wolf tensed in pain, then exhaled and relaxed. Its eyes drooped as the pungent odor suffused the air, mingling with pine-scent. Soon the wolf was snoring. As Voran watched the sleeping wolf, something stirred in his chest—a sense of familiarity and comfort he had only felt on rainy evenings by the hearth. For a brief moment, the wolf was a brother, closer even than any human. Perhaps it was better that he had given up the chance to hunt the stag. This stillness was enough. A rustle of leaves distracted Voran. He turned around to see the white stag returning into the clearing with head bowed. Voran could not believe his good fortune. He would be the successful hunter. His family’s dishonored name would be raised up again on Vasyllia’s lips. Trembling, he reached for his bow. The stag stopped for a moment, as if considering. More boldly, he walked to Voran. Voran’s heart raced at how easy this kill would be, but the excitement died when the stag didn’t stop. He stared right at Voran as he strode. Voran pulled out an arrow and nocked it. The stag walked closer. No. He couldn’t do it. This beast was too noble, his eyes too knowing. Killing him would be like killing a man in cold blood. The stag stopped close enough that Voran could touch him. To Voran’s shock, he bowed his two forelegs and dipped his antlered crown to the earth, a king of beasts making obeisance to a youth of a mere twenty-four summers. Gathering courage, Voran approached the stag. His hands shook as he reached out to touch the antlers. Something shook the branches in the trees ahead. Voran looked up, shoulders tensed. Something, some sort of huge bird, much bigger than a mountain eagle, perched in the crown of an orange-leaved aspen. No, not a bird, something else. Then Voran understood, and terror and excitement fought inside him, leaving him open-mouthed and rooted to the ground. The creature had a woman’s face and torso, seamlessly blending with the wings and eagle body. Her head was adorned in golden-brown curls, and each feather shone like a living gem. A Sirin. She opened her mouth and sang. It was his song, but he had never heard it like this. Voran no longer felt his body. It soared above the clouds; it plumbed the depths of the sea; it hovered on the wings of a kestrel. The song pinioned him like a spear to the earth, but raised him on a spring breeze above the world’s confusion. He was once again in the arms of his mother as she nursed him, her breath a soft tickle. He was inside the sun, and its music weaved him into existence. The earth shuddered, and he knew that he could turn it inside out. The song of the Sirin stopped, and life lost all meaning. It was all grey, ugly, useless without her song. When he came back to himself, the stag, the wolf, the Sirin were all gone, though her song lingered on the air. It seemed he would never rest, never sleep until he found her again.